Emory Professor Marshall Duke has both professional and personal insight into hearing loss. In his own life filled with family, music, students, and countless hobbies, it’s no surprise that hearing aids are one of the most important things he owns. As a clinical psychologist, he sees human connection as the most important factor in longevity and wellness. In his Voices of Audicus interview, Professor Duke shares his experience, warmth, and humor. We were all ears. My ideal weekend would be to bake challahs for my family sabbath, go to synagogue on Saturday morning, do an urban hike in Atlanta with my spouse on Saturday afternoon. See one or two movies or babysit for our grandchildren on Saturday evening. Read the Sunday New York Times over a leisurely breakfast on Sunday morning. Play some music with friends during the day. Watch some British crime shows in the evening. Be grateful for my life and health. I love spending time with my wife and partner of 54 years, Sara. She prefers our grandchildren, but I’m a close second I think. Meeting her was one of the most pivotal moments. Deciding on who you will spend your life with is the most important moment in one’s life. I love spending time with my wife and partner of 54 years, Sara. She prefers our grandchildren, but I’m a close second I think. I can tell you that without my hearing aids, I would have been forced to retire from teaching 15 years ago for lack of ability to hear my students clearly. I would not be able to play music with friends or attend concerts or operas or have conversations with my grandchildren. My life would be totally different and not in a good way. Along with my eyeglasses (I am 75 remember) they are among the most important objects I own. I also treasure my bottles of 10-year-old Laphroaig single malt scotch, but I can find these without my glasses! There’s a study out there that has been going on for 85 years at Harvard that follows people their whole lives. It found that the most important predictor of longevity and health in old age is human relationships. That’s it. It’s far better than anything, better than not smoking or eating right. The most important predictor of longevity and health in old age is human relationships. That’s it. It’s far better than anything, better than not smoking or eating right. I am a clinical psychologist and I see that a lot of people having difficulty as they get older. One thing that I know causes difficulty is loss of contact with other people. People become depressed, agitated, and even paranoid about what’s going on around them and if you can’t hear then all this stuff is exacerbated; it becomes far worse. Then it becomes a vicious circle where people avoid being around other people because they don’t want to be embarrassed. I am a clinical psychologist and I see that a lot of people having difficulty as they get older. One thing that I know causes difficulty is loss of contact with other people. People know you’re old if you have hearing aids or not. Get over it. Is it worth not having friends around you to avoid being embarrassed? No, oh my God. It’s not a big thing, and the benefit of remaining aware of what’s being said around you is much better than anything else. 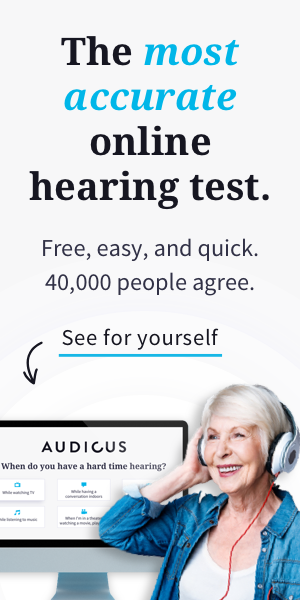 Voices of Audicus shares the empowering stories of our customers in their own words to create a more positive conversation around hearing loss. To hear more inspiring stories like Marshall’s, subscribe to our newsletter below. Explore our blog to learn more about hearing loss and hearing health.